Yesterday’s trip to Chichén Itzá was awesome. Our ride picked us up late around 7:30am due to a misunderstanding, and he dropped us off at one of the more upscale malls in the Hotel Zone of Cancun. We paid for our tickets in the midst of a large souvenir shop attached to a restaurant. We had to wait there for about 20 minutes, and we were told we could buy breakfast from the buffet or shop in the store (the only thing open in the mall). We were given a 10% off coupon for both. Then we loaded into a nice private bus, drove for a couple of hours and stopped for a “bathroom break” 15 minutes from the ruins but conveniently at another gift shop. This one was huge and part of a Mayan village (why didn’t I know there are still Mayans who speak Mayan? 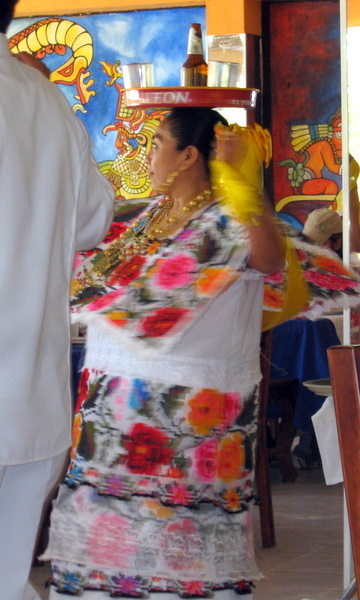 ), and it also held the restaurant where we would be having lunch after our tour. Adam and I bought a bright yellow hand-woven hammock for the backyard. We also got a made-to-order Mayan calendar of our wedding date, which seemed to be the hot ticket item. We finally got to the ruins a little after 12, and our tour guide Santos took us around for a couple of hours. It was a fascinating tour, and he’s a terrific guide. 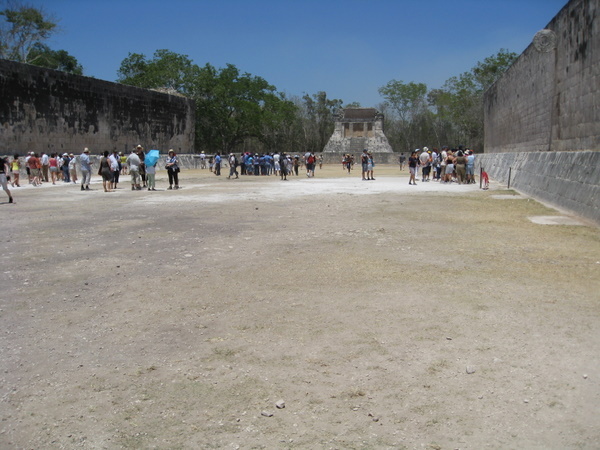 We saw the ancient Mayan ball court (pictured in the second photo, the goal was to get the ball into that giant stone ring on the top of the right wall), and the chamber for human sacrifice of the winning team captain (apparently a great honor). When you stand in front of the famous temple and clap your hands, the echo sounds like the call of a bird considered sacred to the Mayans. And when you clap or call out at one end of the ball court (where the priest sits), it echoes all the way down to the other end and can be heard where the king sits. Very clever. The pyramid itself is a big calendar, which I didn’t know. There are 91 steps on each side, representing the number of days in each season. They add up to 364, and the top of the temple is considered the 365th. There are nine levels to the pyramid, and the stairs split the levels so they represent the 18 months of the Mayan calendar. 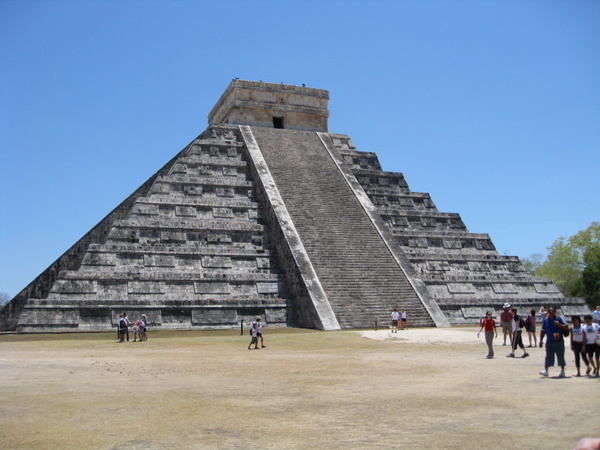 On March 21st, the spring equinox, the shadows fall in a way that makes the main side of the pyramid look like a snake is running down the angles. That’s why there are snake heads carved at the main entrace, that’s the symbol for their god Kukulcan. It happens again in September, and these are huge events at the temple. So we learned a lot, but I also got completely toasted. It was a very hot day, and there isn’t much shade while you walk around the grounds of this ancient city. A 2-hour tour in those conditions would probably burn anybody, but as I’ve been discovering this trip I’m extra susceptible due to my recent antibiotics and steroids for a sinus infection. After we left the ruins we went back to the gift shop/restaurant for lunch and more shopping. It was an “authentic” buffet, but it really wasn’t that spectacular. We were entertained by dancers balancing bottles on their heads, which was kind of impressive. Then back on the bus to head to a cave and then back to Cancun. Our guides got to be heroes when we drove up to a bad accident involving 2 local buses and a car with English-speaking tourists inside. We were delayed there for about an hour because no one involved in the accident, including the medics, spoke any English. So our guides got out of the bus and translated for the tourist couple, who were eventually taken to the hospital. The last stop was extremely cool. We went to the Suytan Cenotes, or sinkhole. It was a cave covered in stalactites that has a swimming hole waaay down. 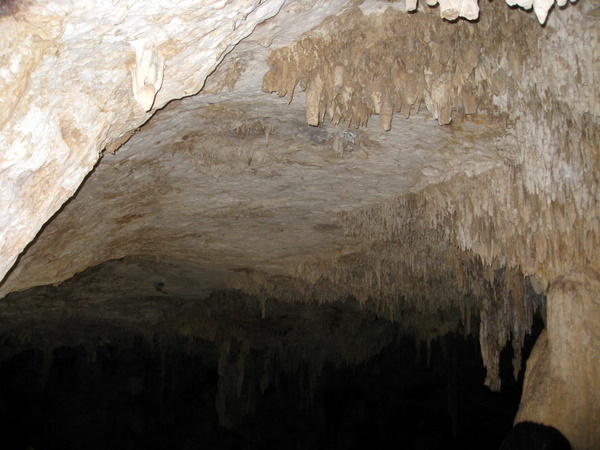 It was beyond impressive, a very creepy and wonderful natural formation. My beloved camera broke on this trip, and I only had Adam’s little point and shoot. So he got the great photos of this cave, but here’s one of the ceiling. Then it was back on the bus for the ride home, where I was conveniently located next to the bus bathroom. This hadn’t been a problem all day, but some poor guy on the bus made 5 or 6 trips on the way back to be violently, loudly ill. Not even Neil Gaiman’s dulcet tones as I listened to the audio book of The Graveyard Book could drown out the sound. So understandably, by the time we grabbed dinner and got back to the hotel room I didn’t much have the energy to blog. But hooray for adventure! Today is our last day here in Cancun, and I have no idea what we’ll do. Be lazy is my guess.